The present work focuses on the study of the effects of mechanical activation on the reaction between hydroxyapatite (HAp) and aluminum metal powder using Algerian phosphate (natural HAp) as a starting raw material. Aluminum metal powder was used to obtain reinforced (HAp) composites materials with alumina. The alumina phases result from the oxidation of aluminum powder at high temperature. 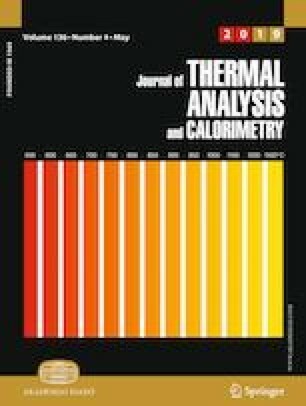 The reactions and phase transformations between HAp and aluminum powder were studied using thermal techniques (DTA/TG), X-ray diffraction (in situ HTXRD and standard), infrared spectroscopy (FT-IR) and SEM analysis. After mechanical treatment for different milling time, no new phases were formed from HAp and Al after 40 h of milling at room temperature. However, all mixture powders were milled for different time showing the formation of several alumina transitions during heat treatment. The oxidation of Al powder, the formation of alumina transitions (χ and κ-Al2O3), α-alumina, HAp crystallization and tricalcium phosphate (β-TCP and α-TCP) formation were affected by ball milling time. After 40 h of ball milling, the aluminum was not detected at 673 K, which confirms the solid-state oxidation of aluminum at low temperatures. The results showed the formation of high amount of α-TCP at 1173 K in the samples milled for 40 h.